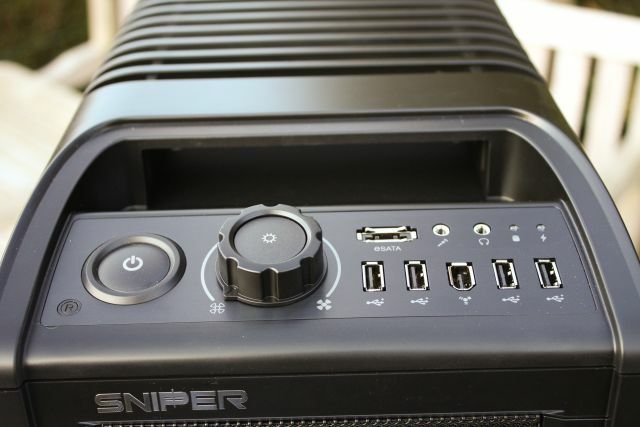 The Sniper is the first case in Cooler Master's new Storm series for gamers. A prototype of this product was presented at the Games Convention in Leipzig last year, and the first retail units started shipping about a month ago. The Cooler Master Storm Sniper is described as an ultra mid tower PC chassis for gamers, it's made out of steel and has several fans along with large front and side mesh bezels to keep your hardware cool. 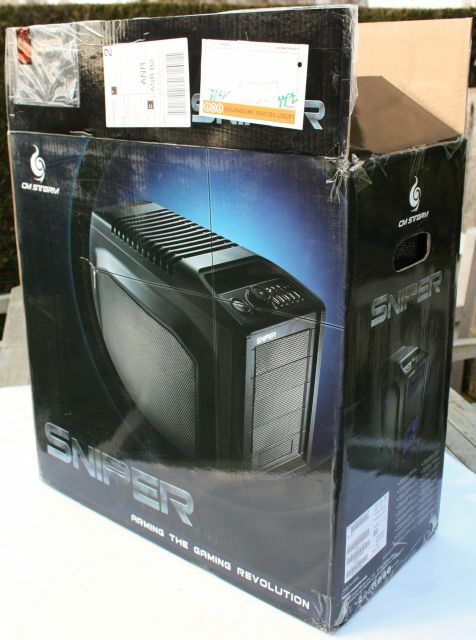 At first sight, the design of the Sniper reminds me a bit of the Cooler Master Cosmos S, but without the handles and with larger air vents. However, after taking a closer look it becomes clear the CM Sniper has several unique features. Below is a first look at the case. The Sniper has a black design, it's made out of steel but it are the black plastic see-through mesh parts that really stand out. These should provide ample airflow. Cooler Master claims the exterior design is inspired by military weapons, but to be honest I can't really see a lot of similarities. The bulk of the front of the CM Sniper case consists of plastic mesh bezels. 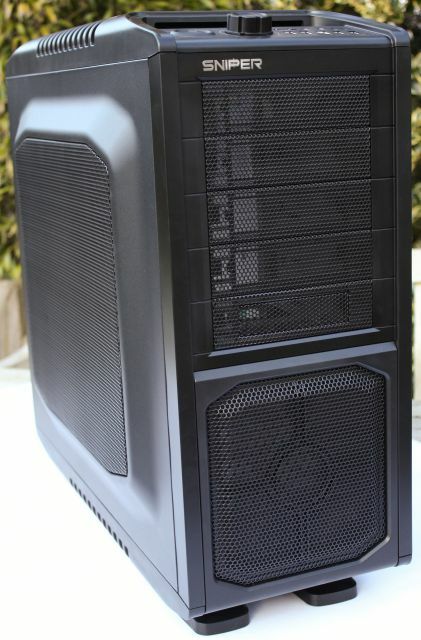 Personally I've grown fond of cases with doors that cover the whole front of the case, like the Cooler Master Cosmos case. These doors take ugly devices like beige DVD burners out of sight and make your case look a lot cleaner. However, while cases with front doors usually look prettier, the mesh design has several advantages. 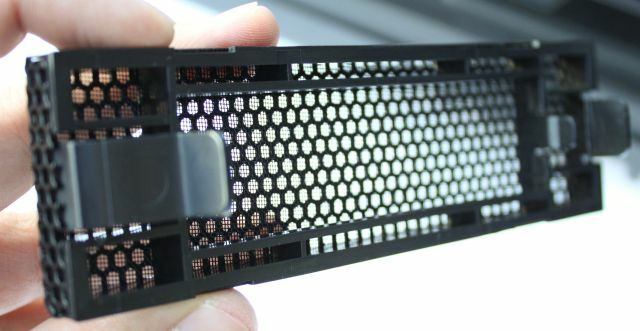 Lots of air can flow freely through the mesh, which may lead to lower temperatures in your case. Another advantage is that some 5.25" devices like fan controllers with large knobs don't play well with doors, that problem doesn't arise with cases like the Cooler Master Sniper. The case has room for five 5.25" devices, and tools are included to convert one of the bays to fit a 3.5" device. 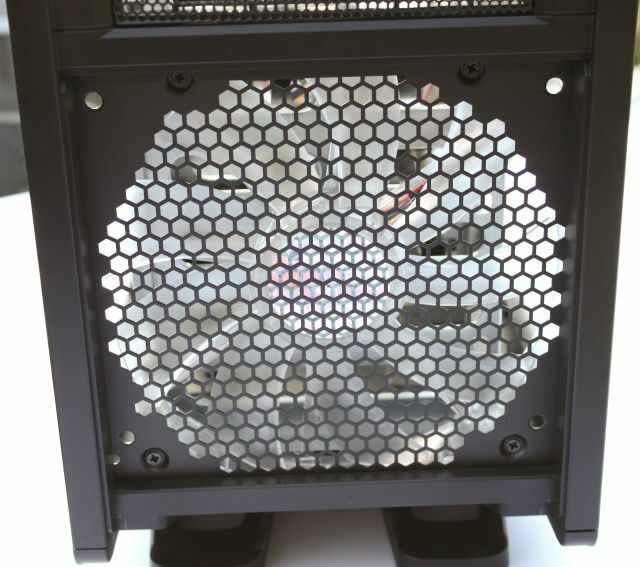 Below the tool-free 5.25" drive bays is a large bezel, behind it is a 200mm blue LED fan. The front also has a small Sniper logo. The drive bay bezels are removed from the inside of the case, they will hold back some dust but probably not a lot. Another part that can easily be removed is the bezel that covers the front fan. This may be necessary from time to time to remove dust. On top of the case is the control panel, one of the unique features here is the fan and light controller knob. It's used to control the speed of up to five case fans, and by pushing the button on top of the knob you can activate or deactivate the blue (or red) LED lights of the fans. Left of the fan control knob is a large power button, but unfortunately the reset button right next to it is very tiny. It's so tiny I have to use the nail of my pink finger to operate it. On the right is the I/O panel; there are four USB 2.0 ports, one FireWire port, one eSATA port, and audio connectors. Furthermore, the panel also features blue power and HDD activity LEDs. Very nice and large case. It keeps my CPU and GPU very cool, fans are very quiet with the fan controller at minimum or even halfway. My biggest complaint is the lack of a side fan for VGA cooling, this should be included with a case that cost me $140. This case looks awesome. I'm going to buy one for my new Core i7 rig.